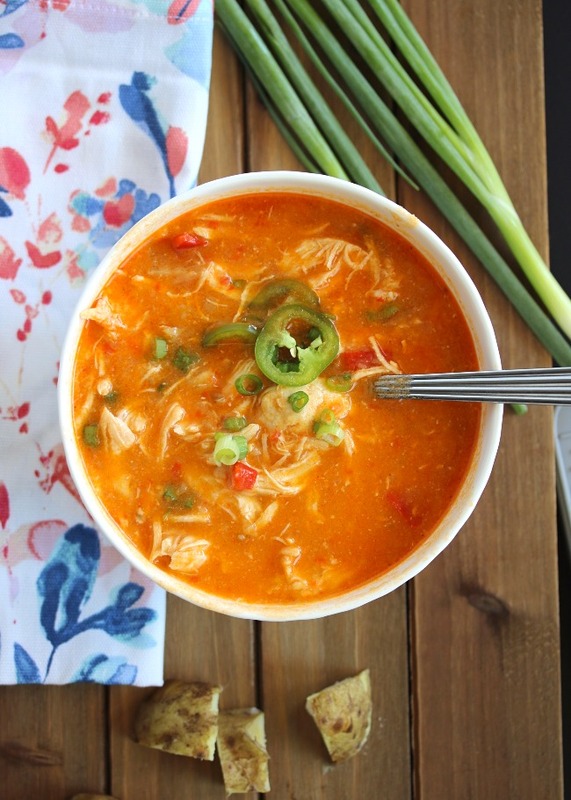 Spicy Buffalo chicken wings meet rich & creamy potato soup for the ultimate tastebud-blasting chowder. This will warm you up on the coldest of days, and leave your mouth watering for more! We're in the full swing of football & fall entertaining season, and it always gets me craving a certain sort of dish. You know that body-warming, bell-filling, ultra satisfying sort of meal? This is what I'm talking about. Now trust me, I love game day finger foods, chips, and snacks just like the rest of 'em- but the same old party fare can get boring after awhile. And for me, the time always comes where I'm ready to hit the breaks on the snack food & get in a real meal before I just keep on snacking the entire day away. So you're craving those junky game day foods, the air's a little chilly, and you need something easy to keep warm on the stovetop & serve when folks are ready to eat. THIS. IS. IT. It's seriously like a buffalo chicken wing flavor fest- but in the heartiest, most comforting creamy soup base. And did I say hearty? I actually call this a chowder because it's not only creamy, but thick from blending sautéed vegetables and tender potatoes. Buffalo=spicy, but this chowder is cooled off just a bit with coconut cream. Enough to stand the heat, but not enough to take away that mouth-watering flavor. 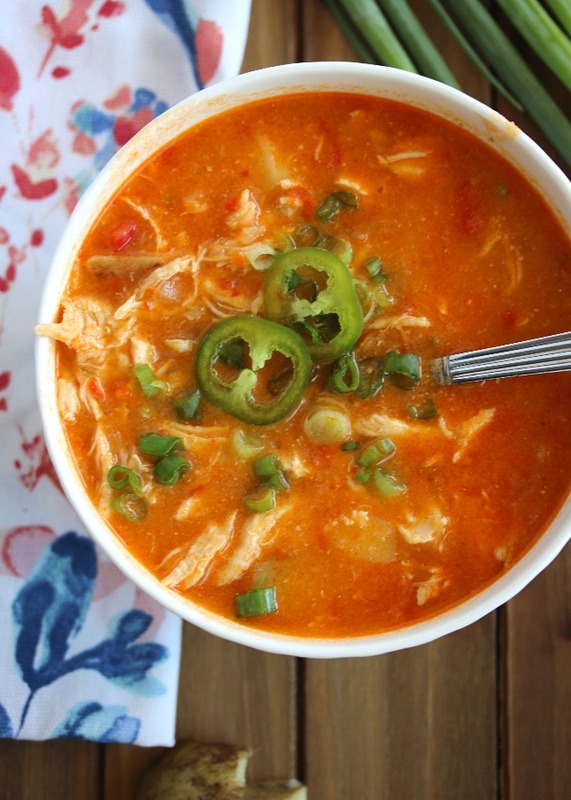 I seriously cannot get enough of this soup, and have enjoyed it even in 80+ degree weather. It's a staple around here, and a football Sunday favorite. Make it for a crowd, or enjoy leftovers reheated. Makes about 6 servings, depending on your appetite! Melt the ghee in a large pot over medium heat. Add the onion, bell pepper, jalapeño, and potatoes, sautéing until the onions are almost translucent. Add the raw chicken, then pour in the hot sauce and chicken broth. Season & give it a good stir. Bring the mixture to a simmer, then cover. Continue to simmer covered on "low" for 25 minutes, until the chicken is fully cooked and potatoes are soft. Remove the chicken breasts & shred with two forks. Using an immersion blender*, blend the soup until smooth*. Return the chicken to the pot and stir in the coconut cream. Warm the soup on low until heated through. Serve hot, topped with your choice of garnish. To the Instant Pot, add the ghee, vegetables, and uncooked chicken. Top with hot sauce, chicken broth, and seasonings. Close the lid and close the vent to "sealing". Set the Instant Pot to Pressure cooking mode on High (manual) for 20 minutes. When the timer goes off, release the pressure naturally (it may take 20 minutes or so to release). When the valve floats up, remove the lid and take out the chicken breasts to shred with two forks. Using an immersion blender*, blend the soup until smooth (I leave a few chunks of veggies behind). Return the chicken to the pot and stir in the coconut cream. 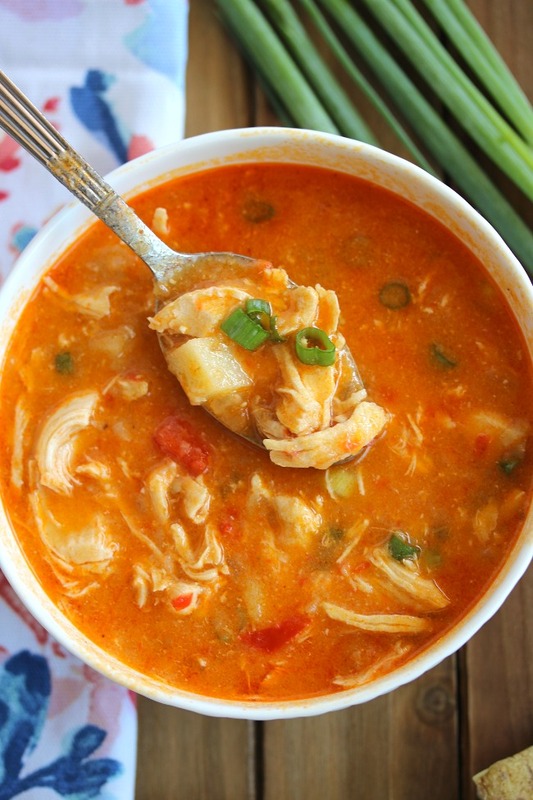 To the slow cooker, add the ghee, vegetables, and uncooked chicken. Top with hot sauce, chicken broth, and seasonings. Cook on "low" for 6 hours. When finished, remove the chicken breasts and shred with two forks. Serve hot, topped with your choice of garnishes. I use an immersion blender because it's easy & convenient. If you don't have one- no worries! Transfer all (or half) of the soup into a large blender and blend until smooth. You can do this in batches if needed. Another note on blending-- I blend the soup until about "halfway smooth". I like it a little chunky with some potatoes & veggies left to bite into. If you blend it all, it will be a little thicker than mine, but still delicious! Does this soup have a cocunutty taste at all? I'm such a weirdo and hate cocunut so I'm always nervous with the addition of cocunut anything? Thanks! I just made this for dinner and it was FABULOUS! For those of you that might be worried about using the bone broth or the coconut, neither of those tastes stand out. This will become one of our go-to meals! I just saw this recipe on Whole30 recipes on Instagram and I want to make this tonight! As for the hot sauce, I have kiddos so not sure if I should omit the hot sauce or can I substitute with anything else? Thanks! Elsa: You could add just a little bit of the hot sauce & taste from there. It would just have a yummy creamy flavor without it!! Add some extra garlic or spices if you need! I just made this in my InstantPot and it is amazing! Starting a Whole30 on 1/1 and this will definitely be made multiple times in that 30 days. Just made this and it is SO good!!!! 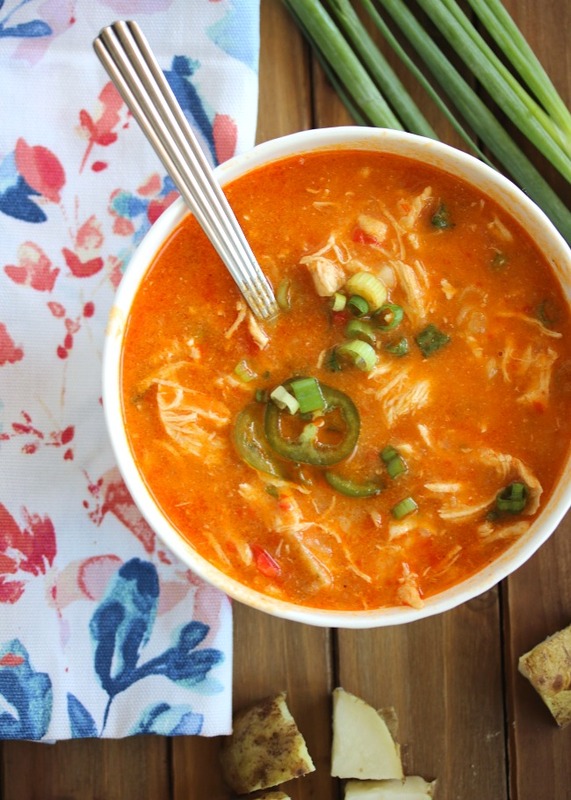 This soup will definitely be in our weekly rotation! I omitted the hot sauce because of my kids, but that didn't stop the husband from slicing up jalapenos and adding dashes of hot sauce. He loved it! Making my day, Yvonne & Elsa!! Love that you enjoyed it! And Elsa, love that you made it work for the kids AND your husband! I just made it and it’s delicious!!! I used 1/2 a cup of Franks Buffalo sauce and 1/4 cup of the Franks Red Hot sauce! It was delicious! Just finished a 50 min run and 1.5 hours chipping ice off the driveway. This recipe popped up as I am trying to warm up and I am definitely making this for lunch today!! So excited!!! I love your blog and insta!!! So fantastic!!! Do you think you could make this in the Instant Pot? Any conversion tips? instead of coconut cream, can sweeten condensed milk work or heavy cream? This is FANTASTIC! I made a double batch when hosting a family dinner while on the Whole30 - they all LOVED it and asked for the recipe! Even my 2 year old loved it! Def going to be a staple in our house! Hi, sounds good. 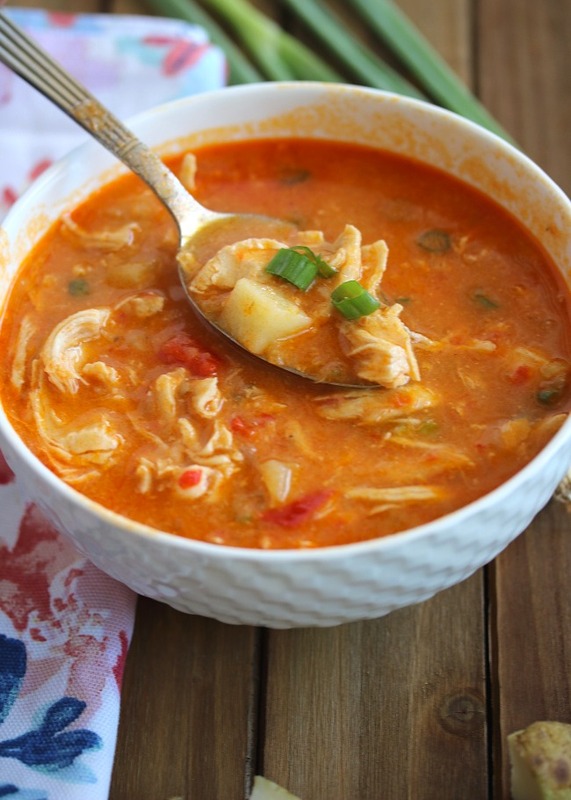 Do you use cooked chicken or does the chicken cook while simmering ? Thanks ! Has anyone tried it with compliant Almond Milk instead of coconut milk? Hi! Any Instant Pot Conversion Tips? Really want to make this soup...thanks! Hey everyone! I've added slow cooker AND Instant Pot directions! Hope that helps!! This looks great! Is there any way to get nutritional information for this recipe? Thanks! I am making the soup right now and the house smells amazing! Have you ever not blended the soup? I am thinking of leaving it chunky. Thoughts? For nutrition information, I use the My Fitness Pal Nutrition Calculator! You can plug in any recipe and it's more accurate since you're putting in the exact ingredients you use. And Silvana- you could totally do that! I just like the thick, creaminess some blended potato gives it. But it would be tasty either way! Enjoy!! Just made this. It was amazing! Making this for dinner, the pics are mouthwatering-cant wait! I can’t wait to make this tomorrow in the instant pot. I was curious To know if the cubed potatoes are peeled. This is an absolute FAVORITE!! Cannot tell you how many times I have made this since I first found it. Originally for Whole 30 but is now mainstream, even the hubs loves it! Game day today and it is simmering as I write :) Thank you!! Wow! I made this for the first time today and I can tell you it is going to be a staple in our household! What an amazing recipe!!! Is there a substitute for potatoes in this recipe? Yum! My husband and I love this - I'll probably have to double it next time. So easy in the Instant Pot. It definitley has a KICK. I mixed 2 hot sauces (Franks and a local variety). Thank you, Jessie! I just made this last night to round out my first week of my very first Whole30 and it was divine!! I have already sent the recipe to many friends! I could not find Frank's Red Hot at any of the groceries near my office (in NYC, what the heck?) so I found a Whole30 approved hot sauce at Whole Foods that came in different spice intensities. I went with the medium and it did not compromise the flavor at all! I made 4 servings and saved an additional 4 small mason jars of the broth which I froze - who knows what I may need them for, but it was too good not to save! Thanks Jessie! Do you have stove top directions for this recipe?